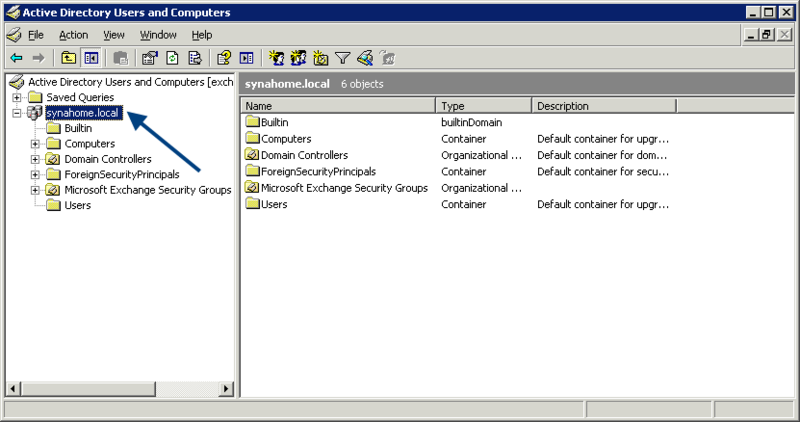 If a user exists on your Windows network, it is automatically added in SynaMan. Additionally, every user that is created automatically can be assigned a home folder allowing them to upload and download files without any manual work. It is common for users to change their passwords periodically. Since users are tied with your Windows domain, SynaMan will always query Active Directory to authenticate users. This eliminates the need for administrators to modify passwords. You must have a Microsoft Active Directory installed on any machine on your network. Typically, an AD is installed on the machine designated as the domain controller. At this time, only MS Active Directory is supported. Future releases will add support for other LDAP servers. Login to the web interface using the admin account. The following table describes fields on this page. AD Domain Name: This refers to Active Directory domain name, which could be different than the email domain for your company. If you are not sure what to type in this field, invoke Active Directory Users and Computers. Click here for a screenshot. 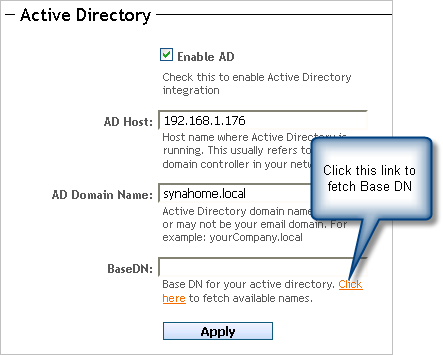 Base DN: This refers to the Base DN for your Active Directory. If you are not sure what to type here, specify Host name and AD Domain name, save the values and then click the link in the description area to fetch this value. Click here for a screen shot. If you decide to use Active Directory integration, we recommend you also specify a User Home Root, which creates a home folder for every new user who logs in for the first time and is authenticated on your network. When a home folder is not specified, users who login for the first time won't have access to any folder on the machine rendering their account useless.